» Can we have more heroes in the game? I'm here today to announce that i recruited a Scripter and a Graphic Designer to speed up the project. I know that the v18 is taking sooo long to lunch, but due problems with the essentials editor, the new update is on hold until the fixes/or new version are lunched/madded from the essentials team. 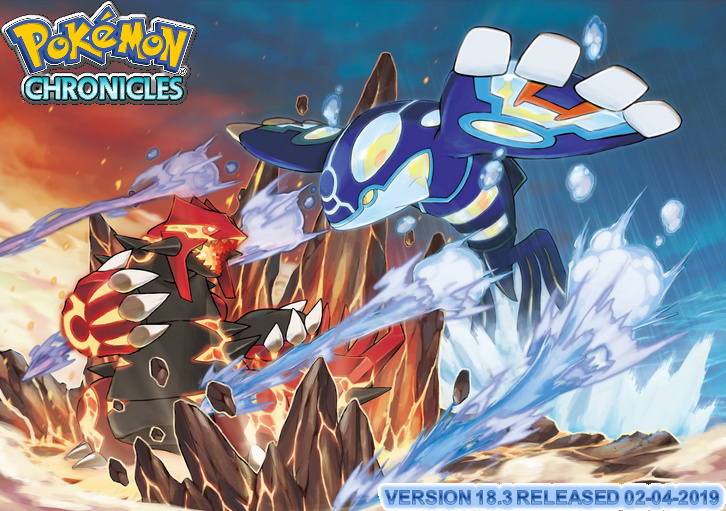 Pokemon chronicles main systems, majority of them, were fully upgraded/updated to support more future features, scripts and other kinds of stuff. The new version are playable but for security measures, i don't released it yet, to prevent save games corruptions. Don't forget that, when playing v18, players MUST START A NEW GAME, otherwise it will crash for sure. But you must delete the save game manualy. Read the game's Word file to find your old save game. Also, i'm still working on the game to fixe issues, adding scripts and stuff for the game. Sorry for the waiting, its not my fault. Pokémon Chronicles Creator: Ricardo PT. The game's email has changed to Gmail now, due to the iol shutdown services. I updated the game mail's link in the v18 update and for further updates. The game old mail's link end on the 30th of November 2018. So, i'm starting receiving the emails in the new gmail account now. Well, i'm here to tell you that i'm recruiting pixel graphic artist and scripters/programmers to complete what needs to be completed. My graphic designer is in hospital for a few months, he never show me his work because of that. But in my opinion, i guess i can't count on him to finish my graphics demands. And, about my scripter/programmer, we two developped the: Help book system, Fame checker system, Berry Blender and Pokeblock systems. But one month has passed and him didn't tell me a word about the Pokemon contests that we are currently developping, so i will wait for his answer until final 2018. Beside that, i'm the only guy again doing almost all of the work on the project. So, if you want to help with pixel graphics, style fire red or programming, I'm here to recruit you. I want to complete the rest of hoenn region on 2019 and the pokeradar system, that is taking me time to finalizing it. After i release the v18.1 in December 2018, i will take a month to celebrate my holidays with my family. So, after the v18.1 update, the next one will take a little bit more time for me to finish. Also, after doing some tests on the project maps, I realized that due to the editor's map limit and the rpg maker xp engine, i can't add more regions to the current game's project. So, Hoenn region will be the last region for this project and it will end its story in the battle frontier. Battle moves animations will be the last thing to be added to the game, because it requires more dedicated time and precision. Maybe in the future i will work on a second project called: Pokemon Chronicles 2 with the rest of the regions. Hint: In New Mauville, second mewtwo with the ability to mega evolve, idea came from the genesect movie, Giovannin tells the player that team rocket will joining forces with team plasma in unova region, and they disappeared after this event. Pokemon Chronicles 2 will continue this events in further story if i decided to work on it. I'm not 100% sure if i will do it. And that's all for now, enjoy the game. I recently recruited another graphic designer. He's doing the overworld trainer sprites. The Pokemon Contests system is almost done. We are currently developping it for 2019 further updates. And, i will complete the pokeradar system and the other things that are imcompleted in the last update, v18.1. Pokemon Chronicles are almost finished but due to lack of time it can take more time than expected. » [Cap.1] - Pokémon Flamejante ou Preguiçoso? O inicio da jornada.